One of the problems with conventional car engine designs is that the pistons move in a straight line up and down in their cylinders, to produce what is known as reciprocating motion. The NSU Ro80 and the more modern Mazda cars with Wankel engines all use twin rotors. The rotors drive an output shaft running through their centre. This shaft is linked to a flywheel to smooth out the power impulses of the engine. The advantage of twin rotors is that, when set to run 180° out of phase with each other, one rotor cancels out any vibrations produced by the other rotor, making for an exceptionally smooth-running engine. Yet the road wheels require a different kind of motion - rotary motion. To convert reciprocating motion into rotary motion, the pistons are linked to the crankshaft so that, as the pistons go up and down, they cause the crankshaft to rotate. The rotary motion of the crankshaft can then be transmitted to the road wheels to drive them round. A car engine would be a lot simpler if the pistons could rotate instead of moving up and down because the rotary motion thus produced could then be transmitted directly to the road wheels (though gearing would still be needed). A further advantage of such a rotary engine would be that the pistons would always be travelling in the same direction - a circle. None of the engine's power would be wasted by stopping the pistons at the end of their stroke and accelerating them again in the opposite direction, as happens in a reciprocating engine. 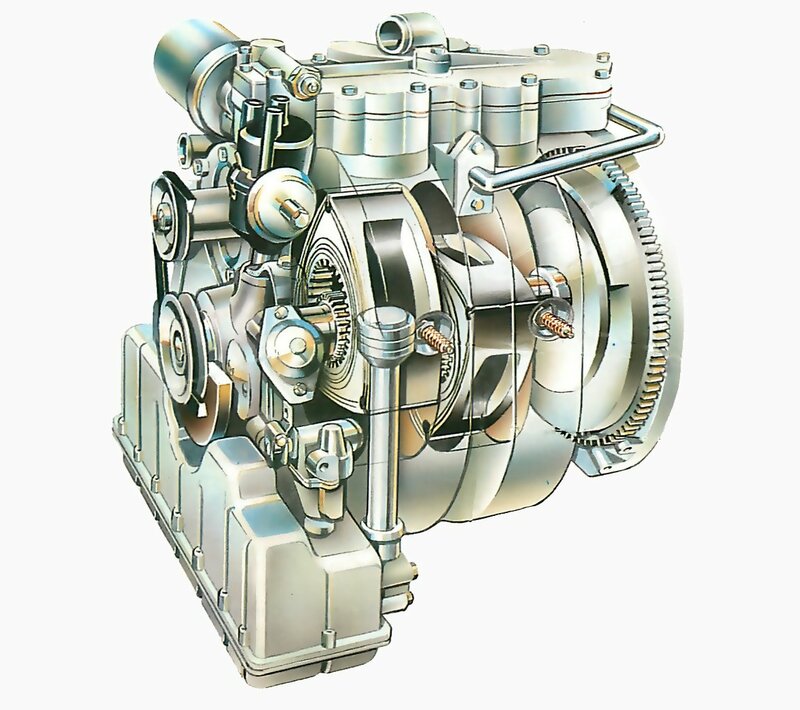 The design of the Wankel engine makes it far more powerful than a reciprocating engine of the same capacity. The NSU Wankel Spyder, with its 498cc engine giving a top speed of nearly 100mph, is one example. More recently, the Mazda RX-7 coupe has an engine capacity of only 1308cc (654cc per rotor), yet has similar performance capabilities to the Porsche 924S with a capacity of 2479cc. In order to equate the capacities of Wankel and reciprocating engines in terms of performance, the capacity of a Wankel engine has to be multiplied by 1.8. This means that the 1308cc RX-7 engine has the same power output as a 2354cc reciprocating engine. Despite the appeal of the idea, only one type of rotary engine has ever been used successfully in cars. This is the Wankel engine, developed by Felix Wankel. He began researching into rotary compressors in 1938. After World War Two he teamed up with NSU (a German car manufacturer later to become part of VW Audi) to turn his compressors into a practicable internal combustion engine. By 1957, Wankel had built an experimental rotary engine which was running on a test bed, and in 1964 this engine was offered to the public in the NSU Wankel Spyder. This small, rear-engined sports car had a 498cc Wankel engine, yet it could develop 50bhp and had a top speed of 95mph (152km per hour). The Spyder never really caught on with the public, and the car that really brought the Wankel engine fame was the NSU R080, which was acclaimed Car of the Year in 1968. This has a twin-rotor engine of 995c and could reach 110mph (176km per hour). The heart of the Wankel engine is a three-sided piston called the rotor revolving inside the rotor housing. On each side of the housing is an endplate. The sides of the rotor are curved into three lobes and the rotor housing is shaped roughly into a fat figure of eight so that, as the rotor rotates, the gap between each side of the rotor and the housing becomes alternately larger and smaller. This constantly changing gap is the key to the combustion process. The fuel/air mixture is timed to enter the housing at a point when the trapped volume between the housing wall and one of the lobes of the rotor is increasing. As this volume increases it creates a vacuum, drawing in the fuel/air mixture through ports in the housing and the endplate. As the rotor moves round, this volume starts to shrink, compressing the fuel/air mixture. This mixture then passes over the spark plug, set into the wall of the housing. The spark plug fires to ignite the mixture, causing it to expand and drive the rotor on round its cycle. At this point the volume between the rotor and the housing increases to allow this expansion of the gases. Finally, the volume decreases again, forcing the waste gases out through the exhaust ports. The rotor thus goes through the same four-stroke cycle as a reciprocating engine - induction, compression, power and exhaust - but each of the three lobes of the rotor is going through this process continuously, so there are three power strokes for each revolution of the rotor. Running through the centre of the rotor is an output shaft, to which the rotor is linked by a system of planetary gears similar to that in an automatic gearbox (see Systems 44 and 45). The gearing allows the rotor to follow an eccentric orbit so that the three rotor tips are continually touching the housing. As the rotor rotates, it drives this shaft around. The shaft carries this rotary motion to the transmission and so to the road wheels. Induction Path taken bytip of rotor Fuel/air mixtureenters inlet port. Outputshaft Rotor revolvesround gear onoutput shaft. As the tip of the rotor passes the inlet port, the following chamber begins to increase in size due to the eccentric orbit of the rotor. This causes fuel/air mixture to be sucked into the chamber. As the rotor continues to revolve, the chamber begins to decrease in size, compressing the fuel/air mixture ready for igniting. Ignition Spark plugs ignitefuel/air mixture. As the chamber passes over the spark plugs, they fire to ignite the mixture. All modern Wankel engines have two spark plugs to ensure that the fuel/air mixture burns evenly throughout the chamber. Exhaust Arrow indicates fatfigure-of-eightpath taken by tip ofrotor. Burnt gasesescape throughexhaust port. The expansion of the burning gases forces the rotor round its cycle, passing over the exhaust port where the gases are forced out of the chamber. This cycle goes on in all three chambers simultaneously. The design of the Wankel engine means that it has no valves - the fuel/air mixture simply enters and leaves the chamber through ports in the rotor housing and the endplate. Therefore it also has no rockers, camshaft or pushrods. This means that the Wankel has about half the number of parts of a reciprocating engine. It is also lighter and more compact. However, it still needs many of the same ancillaries as other engines - starter, generator, cooling system, carburettor or fuel injection, oil pump and so on. Once the engine is installed with all these, it loses much of the advantage of its own compactness and lighter weight. 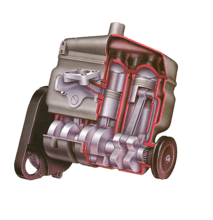 Nevertheless, the Wankel engine in the Ro80 was widely praised for its smooth running and lack of vibration. This was partly due to the engine's having two rotors set in-line with each other but in separate housings. Each rotated about the same output shaft, but their timing was set 180° out so that any unbalancing force produced by one rotor would be cancelled out by the same forces of the other rotor, and so that they would jointly produce a more even turning movement. Even though the problem of seals has now been largely sorted out, it has still not been possible to exploit the full potential of the Wankel engine for vehicle use because of the limitations of engine component life. A further problem is that a conventional reciprocating car engine operates well over a fairly wide range of speeds and loads, whereas the Wankel engine only operates best over a much narrower range. Once the basic design of the Wankel had been established, problems soon became apparent. One was seal wear. The rotors are sealed on all sides to ensure that gases do not seep past the tips from the high-compression parts of the housing to the low-compression parts. These seals were prone to wear and breakdown, causing the engine to lose compression and hence power. 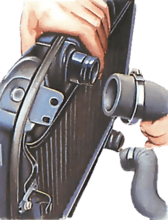 On a reciprocating engine, this sealing is done partly by the valves and partly by the piston rings, but the seals on the Wankel engine posed particular problems. The seals were least effective at low engine speeds, where they need to be fitted with springs to keep them pressed against the side of the housing. But at high engine speeds a combination of centrifugal forces and high gas pressures force the seals much harder against the housing. The resulting friction meant a loss of power and considerable wear on the seals, which soon broke down. Early Wankels had seals made of carbon, but later designs had special cast-iron seals, which proved more durable. To provide extra protection the inside of the housing and the endplates were given a hardwearing coating. The second major problem is wear of the eight-shaped running surface caused by 'chattering' of the seals. This results in corrugations on the running surface and shortens the life of the engine. The induction, engine and exhaust layout of the Mazda 13B rotary engine. This engine has electronic fuel injection with two fuel injectors per rotor. The primary injectors work all the time, while the secondaries only come into operation under increased engine speed or load. 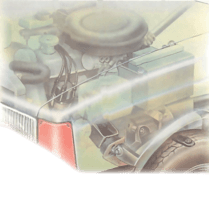 Exhaust emissions are cut by using a thermal reactor to heat up the outgoing gases —the heat being supplied by a heat exchanger further down the exhaust pipe. The other problem with the Wankel engine is the shape of the combustion chamber. In a typical reciprocating engine, the chamber is roughly hemispherical, which helps to ensure that the fuel/air mixture burns evenly and progressively. In a Wankel engine, the combustion chamber is inevitably long and flat, a shape that makes optimum combustion much more difficult. A partial solution to the combustion chamber problem was to fit two spark plugs positioned a short distance apart. Mazda - whose RX-7 is now the only Wankel-engine car on sale in the UK today (see below) - took this principle a stage further by fitting two plugs, with one plug firing a fraction of a second later than the other one. This arrangement requires two separate ignition systems with two coils. Despite the Wankel's power and smooth performance it has so far failed to catch on among the vast majority of car manufacturers. The main reason is its high fuel consumption caused by the tendency of the fuel/air mixture to burn unevenly. Uneven combustion in the Wankel engine also creates another problem - high emission levels of part-burnt hydrocarbons (exhaust pollution). In the years since the R080 brought the theoretical advantages of the Wankel engine to prominence, there have been various oil crises and continuing pressure from governments and the public for lower exhaust emission levels and better fuel consumption. Neither of these demands favour the Wankel engine and, furthermore, it has meant that most car manufacturers have had to devote a lot of time and money to improving the efficiency of their existing engines. Yet the Wankel is in some ways superior to the reciprocating engine. It is probably safe to say that if the earliest cars had had rotary engines, nobody would have bothered to design a new kind of engine in which the pistons went back and forth, continually stopping and starting. As it is, the headstart that the reciprocating engine has had may mean that the full potential of the Wankel engine will never be realized.